In a world where materialism is so prevalent many people are looking for spirituality. Most westerners look for spirituality in eastern religions such as Buddhism and Hinduism. Yet others look for it in nature and 'spiritual music'. Muslims look for it in the works of spiritual masters such as Imam Al-Ghazzali, Ibn Ataillah Al-Iskandari, Ibn 'Arabi or Maulana Rumi and in various spiritual orders. Yet very few look for spirituality in the Qur'an despite it being the most important source of spirituality. The Prophet (SAW) took spirituality from the Qur'an, the companions took it from the Qur'an, the great imams (scholars) took it from the Qur'an and the pious people of this ummah took it from the Qur'an. But why is it that we look for spirituality elsewhere? What is spirituality? How and what does Qur'an teach about spirituality? Who are the Qur'anic models of spiritual masters? Why have we turned away from the Qur'an for spirituality? Where did it all go wrong? How can we turn back to the Qur'an for spirituality? What is the difference between the Qur'anic approach to spirituality and other approaches? These are some of the questions that we may have. One of the aims of The Magnificent Journey Seminars is to answer these questions and to show the amazing depth and breadth of spirituality in the Qur'an. This Saturday we will journey through Surah Al-Qalam which relates to the spiritual development of none other than the Prophet Muhammad (SAW) himself. Is there anything better than the Qur'an for spirituality, guidance and conviction? 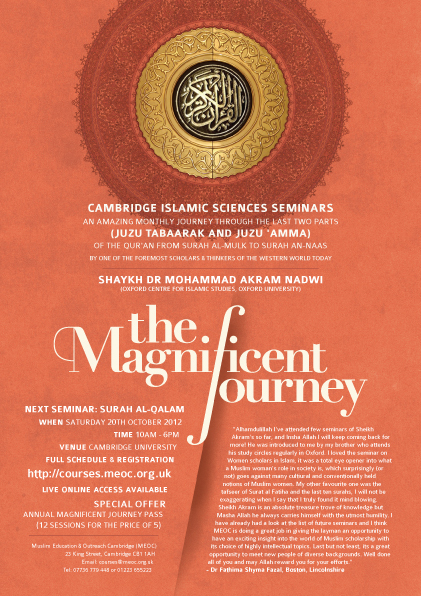 Find out this Saturday at The Magnificent Journey Seminar at Cambridge University.